The agitation that started expressing dissatisfaction with the government’s decision to fix the temporary provincial headquarters, continued in Doti’s Dipayal, Dhankuta and Dang today as well. The two districts in Province 7 and Province 1, both of which have long been organising protests and demonstrations for state capitalhood, have refused to recognise the government’s decision to grant the status of temporary provincial capitals to Kailali’s Dhangadhi and Morang’s Biratnagar. Doti and Dhankuta were shut from early Wednesday morning to build pressure on the government, but to no avail. In Dipayal, the district headquarters of Doti, the enraged locals hurled stones at government offices and briefly seized a police van. Demanding Dang to be the capital of province 5, residents of Dang have come together to protest government’s decision of proposing temporary capitals where a high court is located. Residents have called indefinite strike from today. Since early morning today, schools, markets and industries have shut down, while vehicle movement has come to a standstill. The district secretary of the ruling Nepali Congress (NC), the party’s area president and municipal committee president announced that they were quitting from their positions in the party, accusing the NC President and Prime Minister Sher Bahadur Deuba of letting down the people of Doti. In Dhankuta, the locals burnt the effigies of Prime Minister Deuba and demanded the government to withdraw its decision to base the headquarters of Province 1 in Biratnagar. Earlier in the day, protesters had vandalised a motorcycle for defying the banda at Atmara. 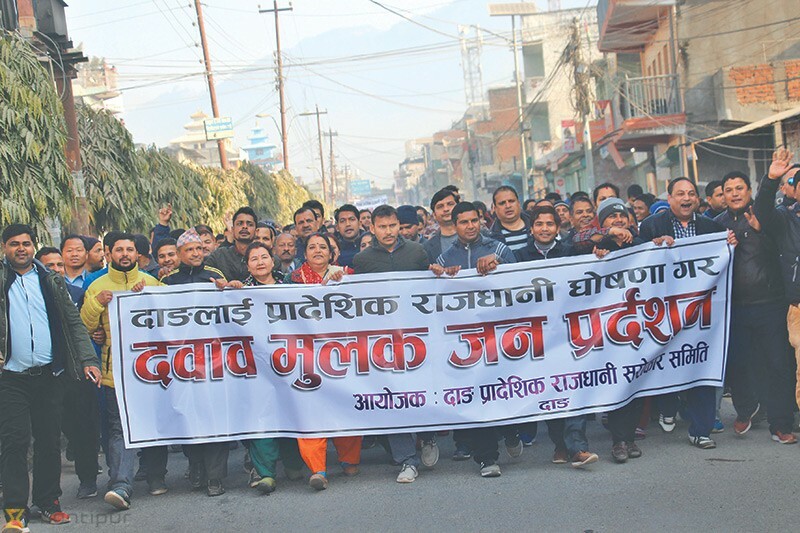 Meanwhile, the people of Dang has called for an indefinite strike from Wednesday to protest the government’s decision to make Butwal of Rupandehi district the temporary headquarters of Province 5. They also staged demonstrations at Ghorahi, the district headquarters of Dang, to protest the decision. The demonstrators also bunt tyres at different places along the East-West Highway to obstruct traffic. At Deukhuri of Lamhai, protesters have shut down market and halted Mahendra highway-thereby affecting passengers commuting the highway. Likewise, Ghorahi, the district headquarter has also been affected. 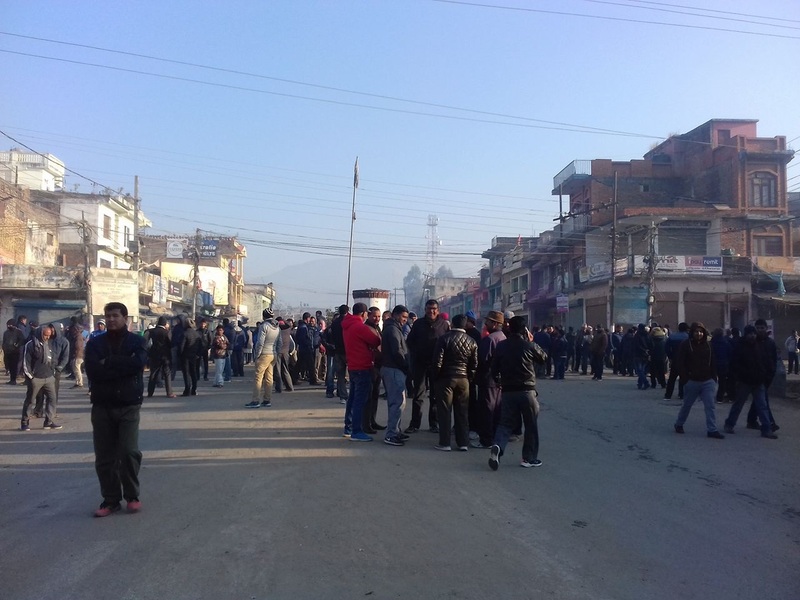 Protest at Tulsipur, one of the major economic centers of the district, has affected vehicle movement from two adjoining districts, Rukum and Salyan. Protesters have been claiming that Dang would be the only feasible option as a provincial capital, and they would continue with the protests as long as their claims materialized. The clash had erupted after agitators pelted stones at the security personnel from the corner meet organised in front of DAO Doti. Police had charged batons and opened dozens of tear gas shells. Agitators claimed that two dozen demonstrators including CPN-UML Doti chair Chakra Malla were injured in the incident. They accused the police personnel of firing tear gas shells in the peaceful demonstration. They alleged that police personnel had charged batons indiscriminately to all and sundry. Agitators clashed with security personnel in Doti’s Silgadhi. Over three dozens of agitators including police personnel were injured when the protesters clashed with police personnel. Doti locals are agitating against the government decision to fix Kailali’s Dhangadhi as the provincial capital of Province 7. Doti police Chief SP Madhusudan Luitel, however, refuted the allegation and said that police had to charge batons and fire tear gas shells for their self defence after the agitators pelted stones at them. SP Luitel said situation was brought under control after long and hard efforts. Doti remained shut for the third consecutive day today demanding that Dipayal be made the provincial capital. Market places and educational institutions pulled down their shutters. Buses stayed off the road while government offices, industries and factories remained closed. Agitation Coordination Committee Coordinator Narendra Khadka said their agitation would not come to an end unless the government corrects its decision. Similarly, after the government fixed Biratnagar as temporary capital of Province 1, agitation has become stern in Dhankuta. The agitation with demand to make Dhankuta the provincial capital for the past 34 days has hit normal life very hard. A meeting held between the local administration and Provincial Capital Struggle Committee today ended inconclusively. After the talk, Struggle Committee Coordinator Sundarbabu Shrestha said general strike would continue in Dhankuta. He informed that they would announce other programmes of agitation. District Administration Office Dhankuta lifted prohibitory order from 5:00pm today. The DAO had imposed the order from Thursday saying that the agitation had turned violent. Due to the prohibitory order, commuter and heavy trucks plying along the Koshi highway had been stuck midway. With the lifting of the order, vehicular movement has resumed on the highway. Protests continued in Dang also. The strike called with demand to make Dang provincial headquarters has hit the normal life very hard. The government offices remained closed. Some offices were shut down forcefully by the agitators while some were closed by employees. Buses stayed off the road while schools, business organizations, factories and market places pulled down their shutters. 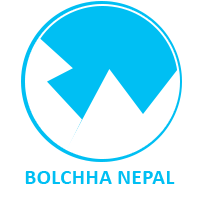 The government has fixed Rupandehi as provincial headquarters of Province 6. Struggle Committee Dang Secretary and CPN-Maoist Centre Dang District joint in-charge Nirmal Acharya said their agitation would continue unless Dang was fixed as provincial capital of the Province 6. Local political parties have supported the protest. An Extrovert, Technical Writer, Blogger and IT Analyst. He is a Technology Enthusiast with a keen eye on the Cyberspace and other tech related developments.